Ginger supports all struggling writers, including those who have learning difficulties such as dyslexia, and English language learners. 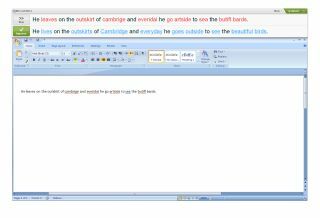 Ginger uses patent-pending technology to automatically correct misused words, grammar and spelling mistakes in Microsoft Word and Outlook. For additional functionality, users can purchase Ginger Premium, which offers the same features as Ginger plus text-to-speech and progress reporting. Pros: The software can take just about any misspelling and/or bad grammar and correct it. Integrates seamlessly with Microsoft Word. The premium edition not only corrects spelling and grammar, but can read back the correction. Cons: The product does require an Internet connection. It installs a small applet, then all corrections come over the Web. Overall evaluation: Because the program can correct even the most misspelled words and bad grammar, it works especially well for ESL and special education students. The text-to-speech option will be also very helpful, especially for these students. Retail price: Starts at $145 for 3 stations.